I do not hide the fact that I am partial to ladies with red hair. If you ask anyone who has known me for longer than five minutes, they can probably tell you that. Given my Irish ancestry, perhaps there is a genetic reason for that attraction. Or I am just a glutton for punishment. One or the other. Redheads have, throughout history, been persecuted, revered, feared, and worshiped. The early Christian Church often depicted Eve as having red hair because, you know, only a redhead could get Adam to do something so stupid! Wonder why redheads were targeted during the witch trials in Europe? It is all Eve's fault. The Church believed that red hair was the mark of the devil! But not everyone feels that way. In Ireland they say "Lucky a man is to have a redheaded wife!" In other parts of the world though they are still feared, which, I must say, if you have been on the receiving end of a redheaded woman's temper, makes perfect sense. Redheads are passionate people and thus a few have made their stamp on history. So without further delay, I give you my top five redheads in no particular order. 1. 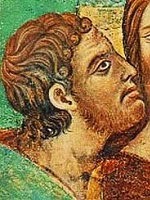 Judas Iscariot: Now, do we really know if Judas Iscariot had red hair? Not really. But the early Catholic Church often depicted him as such. Why is Judas in the top five? Who can argue that he didn't have an impact on history after the whole selling out Jesus thing? I'd say that is pretty important from a theological standpoint and from a historical standpoint. There is also an old Catholic saying "There never was a Saint with red hair!" It isn't true, or course, but it is a fond saying nonetheless. Ol' Judas came to a bad end for giving Jesus up for some silver. Would he have done it if he had brown hair? Probably. I'm thinking it had more to do with the money than his hair color. 2. 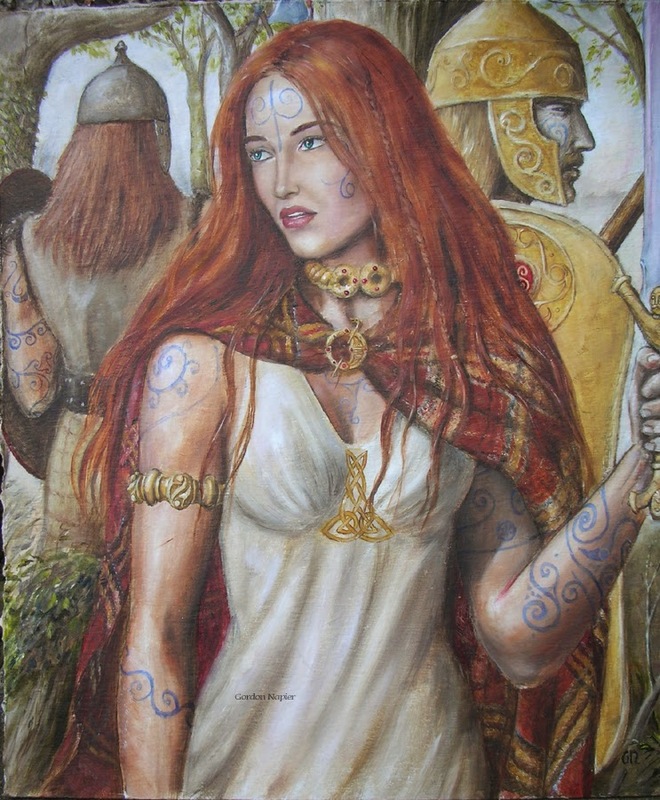 Queen Boudica: She is one of my favorites. She previously gained attention in my list of the Top Five Bada$$es of History. This is what I had to say about her. "Ever heard of Xena Warrior Princess? I admit, I watched the show religiously while I was in college. I even had a Xena action figure which is, among other things, probably why I didn't date that much. Move over Xena. Celtic Queen Boudica is a bigger badass than you! Celts tended to treat women with a little more respect than many other ancient tribes. However, Boudica ran afoul of the Romans. Her daughters were raped while she was forced to watch. While this was going on, the Romans were also flogging her. There is one thing you should never, never do. Piss off a redhead. She raised an army and led a revolt against Roman rule in Britain and even waxed a couple of Roman units in battle. Legend has it that she rode into battle in a chariot with her daughters on both sides of her. Alas, ultimately might prevailed and she was defeated. No one knows the exact site of her death. Nor do we really know how she died. Some say she fell in battle. Others say she killed herself to avoid being taken prisoner and tortured to death by the Romans. I say maybe there is another option. She didn't die but was simply taken up to Heaven by the gods. But for a brief moment in time, a redheaded woman made the whole of the Roman Empire tremble in fear." You can see that list here. 3. 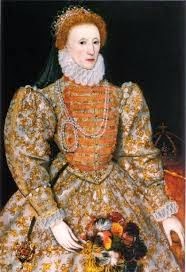 Elizabeth I: Redheaded women hold strange powers over men. Look in a redheaded girl's eyes for too long and you'll fall in love. Men have a tendency to do stupid things trying to impress women, red hair or not. Phillip II of Spain wanted to change the fact that Elizabeth was the Virgin Queen. He sent marriage proposals which were rebuffed. Not to be outdone, he then decided to invade England and force her to marry him. Now I'm no Dr. Phil, but had his plan succeeded I rather doubt that would have been a recipe for a happy marriage. In 1588 his armada sallied forth to take on the Royal Navy, seize the English throne, and deflower the Virgin Queen. Thanks to foul weather and Sir Francis Drake, his mighty force was destroyed. He made a few other attempts that also ended in failure in subsequent years. The defeat of his mighty fleet of ships made it possible for England to make its first serious attempts at colonization, giving rise to the first permanent English settlement in North America at Jamestown in 1607. Her Most Brittanic Majesty's Fleet would be the most powerful navy in the world until the 20th Century. The Spanish Empire entered into a long, slow period of decline. It wasn't all a bed of roses though. Elizabeth made war on my people, the Irish, whom she described as "a nasty and brutish race". Tens of thousands were slaughtered as her armies ravaged the Emerald Isle. But, as Muricans, we have to acknowledge that we owe our country's existence to this redheaded gal. And also to the next person on our list. 4. 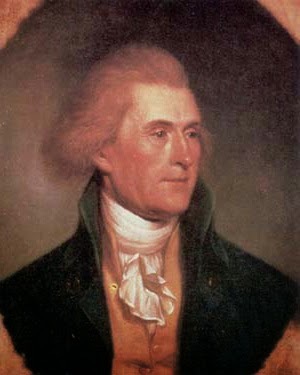 Thomas Jefferson: A lot of folks don't know that Ol' Tom was a redhead. Like most men of his class and position, he wore a powdered wig most of the time. But underneath it he sported red hair. Jefferson was perhaps the most gifted writer of his era. The Declaration of Independence is a masterful document that was the product of a group assignment gone horribly wrong. We've all been there. You get put into a group and then get stuck doing all the work yourself! Unfortunately for Thomas, he's being written out of the history books for political reasons. Those on the far right dislike him because he dared stand up for a man's belief to practice any religion he wanted. Those on the left don't like him because he owned slaves. None of that can or should take away from his accomplishments. Jefferson once wrote "It bothers me not if my neighbor worships one god or many. It neither breaks my arm nor picks my pocket." I think we should all keep those words in mind before we criticize another's religious beliefs. 5. 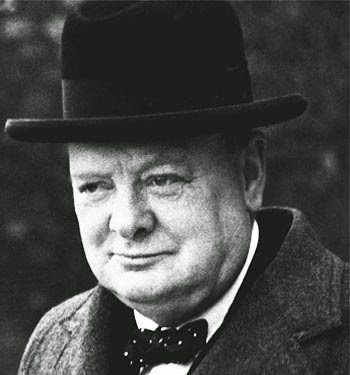 Winston Churchill: No list of famous redheads from history would be complete without including Winston Churchill. I don't really know what to say about him because there is so much. An unrepentant imperialist, he managed to keep England from folding in the dark days of 1940. His speeches inspired the English people to absorb everything the Germans could throw at them. "Keep Calm and Carry On" was the watchword of the day, not something invented recently like so many people think. Perhaps my favorite Winston quote was when he said "History shall be kind to me for I intend to write it." And by and large it has. Sure he had his faults, but we all do. He was a masterful politician and a charismatic leader who inspired a small island country to stand in the face of seemingly insurmountable odds and come out on top. Ever notice how all newborn babies look like Winston? Honorable Mention: There are two other worthy people I'd like to add. Mark Twain, the greatest of all American humorists, was a redhead. He also liked cats. That makes him one of my favorite writers. I feel as though I should also include the artist Van Gogh. When I took art appreciation in college, the teacher went around the room and made us say who our favorite artist was on the first night of class. When she got to me I said "I don't know what they guy's name is. I don't know a single thing he painted. But I like the guy that cut his ear off and mailed it to a prostitute." The class was amused. The professor was not. Well, the guy's name was Van Gogh and he was a redhead. They have a habit of doing crazy things when you anger them. I consider myself lucky to be married to a beautiful little redhead who exhibits all of a redheads good traits, mixed in with the famous temper! But I have learned the secret to being married to a redheaded gal. Do what she says and she won't murder you in your sleep. There is nothing in the world like the love of a redheaded woman. Bruce Springsteen certainly got that right! I consider myself lucky and blessed. My redhead. She is little. But dynamite also comes in small packages. Wow!! I just loved reading this post because I am also a redhead. Thanks for sharing this great post on famous and beautiful redhead person from history. My favorite is Judas Iscariot. Do you know about him?